Aboriginal Art Directory is delighted to offer this eulogy delivered at Gangan Homeland in Arnhemland on 18 January 2017 by Barbara Spencer, former Executive Officer of the Aboriginal Cultural Foundation, as a tribute to the inspirational Dr Gumana. With her partner, the late Lance Bennett, Spencer staffed the ACF on behalf of its executive of Aboriginal tribal leaders from its establishment by 'Nugget' Coombs in 1970 to its sad and unnecessary demise in the 90s. “Ladies, gentlemen and distinguished guests. I first met Dr Gumana in Darwin in 1973, when he came to the Aboriginal Cultural Foundation’s office in Central Arcade, Darwin, to tell us he had been chosen by Miwatj Yolngu to represent them on the Aboriginal Cultural Foundation. Marlu (as Spencer affectionately called him) was brimming over with happiness, telling us how he and his father, Birrikitji One were leading their people back to permanent communities in the East Arnhem homelands. How the Gangan airstrip had been cleared using tomahawk, shovel and mattock; stringybark and paperbark humpies had been built by hand the same way over a period of eight months. There was no mechanical equipment to help with this heavy labour, and in those days it was an eight-hour drive from Gangan to Yirrkala. Marlu told us of the lifestyle at Gangan. Bark painting had continued in the Dry, to earn income. When the Wet season came, the families had lived for five months on bush tucker, and after that, food had to be air-dropped by Missionary Aviation Fellowship. Marlu said: “I didn’t work for pay. I worked for the life of people because I knew Yirrkala would be a place of hardship when the mining came. I myself pushed my people to move back to their land”. As a young man, Dr Gumana had been deeply knowledgeable in ceremony matters, as a result of living with his father. And knowledgeable in people-management from his time as a patient at the Leprosariums on Channel Island and, from 1955, East Arm. He was trusted as a leader both by Yolngu patients and by the balanda authorities: as a person who could take responsibility for other people. 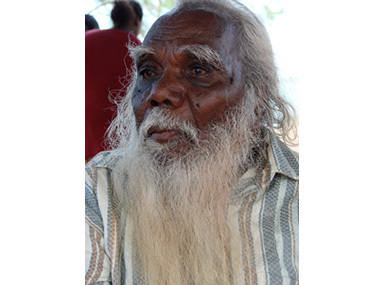 He became Christian in 1959, and a pastor in 1963, assisting with the Yirrkala Church Panels (which asserted the authority of Yolngu power structures and showed there was no incompatibility between Yolngu and Christian belief), and the 1963 Bark Petition, prepared in response to the imminent arrival of mining at Gove. Dr Gumana was elected Chairman of Arnhem Presbytery of the Uniting Church around 1969 and was ordained a Minister in the Uniting Church in North Australia in 1991. Dr Gumana knew instinctively how to be a good negotiator. “Fighting with words”, he called it. He developed this skill following his role as an interpreter for his father at the NT Land Rights hearings in the Supreme Court in 1972. He said, “We started the Land Rights movement, and eventually we won, not with bad feeling but through being calm and persistent, and showing our deep knowledge of the land”. He was a member of the Aboriginal Cultural Foundation’s Executive from the very beginning. In 1975 he became Vice-President, and in 1980 was elected the Foundation’s Chairman. The Foundation had started in 1969 at the wish of Dr HC 'Nugget' Coombs, with the aim of maintaining and strengthening the traditional cultures right across tribal Australia, under the ownership and managership of their custodians. With Old Man Nandjiwarra Amagula from Groote, in 1981 Dr Gumana led a large company of dancers and songmen to the United States on the first Aboriginal Cultural Foundation tour. The 35 artists, from Lajamanu, Aurukun and East Arnhem performed to packed audiences in major venues in Los Angeles, Washington, Philadelphia, New York and San Francisco. It was a high-profile tour, a gift from the Australian Government to the American people. Dr Gumana was interviewed by top newspapers such as the New York Times, the Washington Post and the International Herald Tribune, and interviewed on American television. His message was “Our culture is alive and strong, we are living our culture”. The response from American audiences was immediate and emotional. Marlu went on to lead large groups of dancers and songmen on similar ACF tours to Italy and to Paris in 1983 for a fantastically successful season in the Autumn Festival, when Le Figaro newspaper pronounced Australia’s Aborigines the visitors of the year, to the Festival of Perth, and in 1988, to the Bicentennial Adelaide Festival. Again, newspapers and television interviewed him widely. Marlu took it all in his stride. All the time, the Cultural Foundation was encouraging and supporting the practice of traditional ceremony, especially in tribal areas where it was falling away. From the Kimberley to Cape York, and down through the Deserts, tribal songmen and dancers who came to the Foundation’s eighteen great inter-tribal festivals, respected and admired Dr Gumana, saying he gave them courage. He was very well known across tribal Australia. When Dr Gumana was ordained here at Gangan, as a Minister in the Uniting Church, the event was followed by a big Ngarra ceremony. Dr Gumana said, “I was always very interested by the fact that Marraiyin rules are exactly like the Christian Ten Commandments. So I knew the two were not contradictory, but in line, standing together”. Marlu was always a thorough teacher. For years, I had a little orange car which Marlu called ‘Dhakawa’, crayfish. He noticed that I often forgot to release the handbrake, especially if I was talking. It became automatic for him to say, as I turned on the engine, “Handbrake, gathu”. I still hear his voice, when I start my car and smile. In 1994, Prime Minister Paul Keating and his political advisers established a new Commonwealth Cultural Policy, Creative Nation, in which the ACF’s small grant was diverted (towards an urban Indigenous performance training school in Brisbane), leaving the Foundation high and dry. Yolngu across Australia were distressed that their Foundation could be simply killed off by a political decision made in the South. Three years later, Dr Gumana was a key participant in making the Saltwater Collection of bark paintings reflecting Yolngu connection to the sea, assisting the successful legal appeal to the High Court. In 1999 he spoke out, emphasising the importance of education in the homelands. Marlu went on to earn some very high awards, including the Big Telstra at the National Aboriginal & Torres Strait Islander Art Awards in 2002 (for the magnificent larrikitj which told the founding myths of his Dhalwangu clan, Birrkuda ringgitji (Wild Honey)); the Red Ochre Award in 2009; an honorary doctorate from Charles Darwin University for, as the citation said, “outstanding leadership and achievement in the fields of the arts, Aboriginal cultural maintenance, Aboriginal community advancement and the promotion of intercultural understanding and respect”. And in 2003, Officer of the Order of Australia for making an outstanding contribution to his community and to Australia through his actions and achievements. I first met Dr Gumana in 1983 when the ACF group heading for the Festival d'Automne in Paris needed to buy winter clothes in Sydney. Later, we talked at the great 1985 Groote Eylandt inter-tribal dance festival in the Gulf of Carpentaria which first introduced me to Aboriginal cultures. Both recalled that encounter many years later at a Garma Festival where we agreed that Garma's public bungguls were definitely not a match for the intensity and spirituality of that dancing on Groote, intended as it was as a demonstration of cultural maintenance to other tribes. I subsequently nominated Dr Gumana for the Sydney Peace Prize – which would have been absolutely justified recognition for his work in both proudly sustaining Yolngu culture and in introducing his culture to non-Indigenous peoples all over the world. The delay in publishing this eulogy was determined by Dr Gumana's family, who wanted to be able to mourn appropriately undisturbed by publicity. 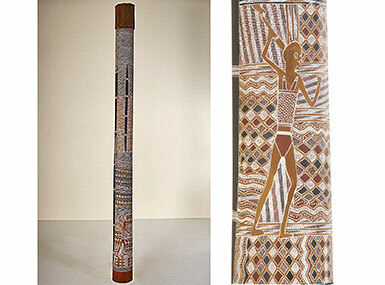 The larrakitj which won Gawirrin Gumana the 2002 NATSIAA Telstra First Prize; 'Birrkuda Ringgitj'. 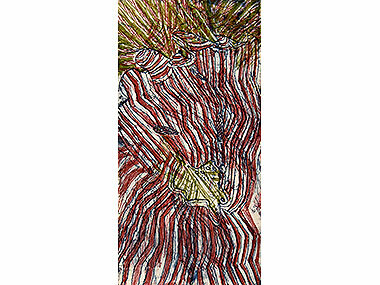 Close-up showing the ancestral figure Lany'tjung carrying sacred objects north to Yirrkala bringing the lore.